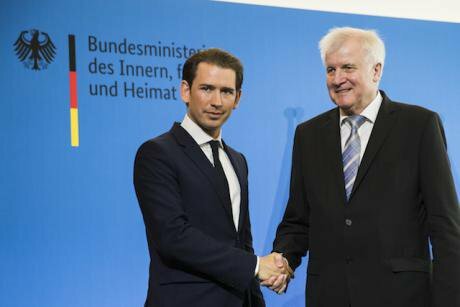 'Axis of the willing': Seehofer and Kurz in a press conference at the Interior Ministry in Berlin, Germany on June 13, 2018. NurPhoto/Press Association. All rights reserved. Donald Trump’s first visit to the United Kingdom since he became United States president was met with a wave of protests whose sights, across the weekend of 13-15 July, included a six-metre tall "Trump baby" floating high above central London and a hand-glider flying close to the president's entourage as he surveyed one of his Scottish golf courses. This was but the latest of many disruptive episodes, both domestic and foreign, in Trump's presidency. But the two parts are linked by the way that Trump embodies the current expansion of racist and nationalist policies on a global scale precisely by presenting himself as the antithesis of Europe. In fact, his separation of immigrant children from their parents and then their caging, while talking of “infestation”, were presented in tandem with his ominous warning about the threatening example of European “openness” towards migrants coming to America. Such instances of racism in the age of Trumpism are clearly a real threat to democracy. Yet the further problem is that even in reacting to them, hypocrisy has become a guiding principle. Thus some European politicians criticise Trump and implicitly project a sense of their moral superiority even as they too get tougher on border controls and migrants' conditions. Britain's official "hostile environment", for example, requires landlords, doctors, public servants, and even universities to act as border guards and ID checkers. But in truth, solidarity is losing its meaning, not only on the Mexican border but across the Atlantic. Many EU member-states refuse any relocation of refugees from outside Europe, an approach pioneered by Hungary's prime minister, Viktor Orbán. Even Germany's government, leaning more to the right since the September election, has been virulently divided on the issue. Italy's interior minister in its new government, Matteo Salvini, has banned charity rescue boats from docking in Italian ports, leaving migrants (including those with children) stranded in vessels for days in the Mediterranean Sea. Most recently, Czech prime minister Andrej Babiš has refused a request from Italy's prime minister Giuseppe Conte to accept some of a group of asylum-seekers in Italian waters; only five EU member-states out of twenty-seven have responded positively to Conte’s appeal. The reality is that the establishment critique of anti-system forces, including the far right and populism, has become full of selective double standards.The reality is that the establishment critique of anti-system forces, including the far right and populism, has become full of selective double standards. Many European governments and and neo-liberal pundits embrace a tough immigration stance even as they scorn the harsh treatment and extreme rhetoric of Italy's new coalition government. At the same time, many from these elites are almost silent about the far-right nationalism of leaders such as Orbán, whom alt-right champion Steve Bannon has hailed as the "Trump before Trump”. Why is this? An easy answer is that populists and far-right leaders are more acceptable when and if they belong to the same party family or political group. Many EU conservative politicians who are critical of the Italian government are members of the centre-right European People’s Party (EPP) which, born of post-1945 strands of Christian democracy and allied forces, has long exerted strong influence over the main EU institutions. But in practice the boundaries between such moderate conservatives and the far right are often porous. For example, when former neo-fascists of the Movimento Sociale Italiano/Alleanza Nazionale merged with Silvio Berlusconi’s EPP-affiliated Forza Italia in the tycoon’s new party movement, Il Popolo della Libertà (PdL), they were accepted among centre-right moderates in the European parliament. Some are still there. Orbán’s own party, Fidesz (Hungarian Civic Alliance) is an affiliate of the EPP, as is the ÖVP (Austrian People’s Party) of Austria’s chancellor Sebastian Kurz. The Italian coalition government of Lega and Movimento 5 Stelle (5 Star) is, like Maduro, close to Putin; but unlike the Venezuelan dictator, Italy’s anti-system movements are also becoming closer to Trumpism and its close partners. They back each other, as when Salvini met Raymond Burke, a powerful Trump-supporting US cardinal. Just as Trump's slogan is "America First", so the Italian interior minister states his guiding principle to be “Italians First”. Hungary's foreign minister Peter Szijjártó, referring to the migration emergency, similarly declares that "the security of our own citizens must come first.” Like Trump, these European politicians use the idea of being anti-political as a camouflage for their racism. Within governmental institutions and moderate parties, in other words, there has been a gradual legitimising and accepting of ultra-right wing culture. In the process, the pervasive impact of this culture on western constitutional democracies has been overlooked. The result is less democracy and more extremist policies.